Is Google’s Digg-Like Gadget an Indication of Future Plans? 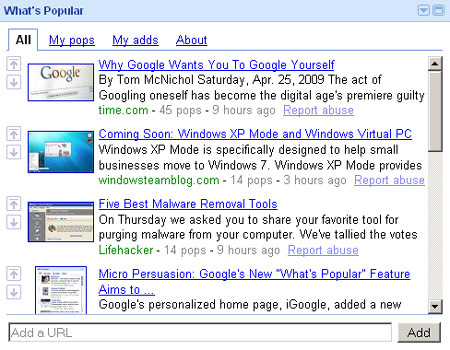 Google has released a gadget called What’s Popular for iGoogle. You may draw some connections between it and a certain site called Digg, and some are speculating that it is even an indication of a broader plan from Google to creep into Digg territory. What would a Google-owned version of Digg mean to you? Tell us. Google says the What’s Popular gadget uses algorithms to find interesting content from a combination of user submissions and trends in aggregated user activity across a variety of Google services, like YouTube and Google Reader. Users can rate items that they like or dislike by clicking the ratings buttons next to each item. The gadget then looks at what users liked and disliked to adjust the ranking of items. Users can directly submit URLs, and if they become popular, they can rise to the top of the list. You can associate your Google user name with your submissions, and edit titles and descriptions. You can also keep track of what you have submitted in the “My Adds” section. Yep, that sounds about like Digg.